Read more on AMD's Threadripper platform. i hope three month away there will be an asus strix x399 mobo for around 350-380 euro. the asus zenith comes with a 10gb ethernet card right? as much as i would love 10gb, the 10gb switches are way too expenisve. asus has a 2 port 10gb (+4 1gb ports) switch for 220 euro. but only two 10gb ports are a bit lame. i have 6 systems so i would need at least 7 ports (1 for internet connection). Good god they're pricey! That's some serious Asus tax! You have 10Gig Internet readily available? Yeah, it has a 10g Ethernet card. Those things are pricey. This is more of a flagship board vs a more standard high-end design. ASUS has a Strix board coming that will likely have similar pricing to the other boards. lets hope so. i have seen the prime x399 but no word about a strix model yet. Been thinking. You know a CPU is good when a company like Asus come up with a completely new name for their high end board. Amazing stuff really. Some one duly pointed out to me on another forum that we haven't seen the X299 "Rampage" or whatever it's going to be called yet. And that will cost far more than this. I reckon £700 or more. 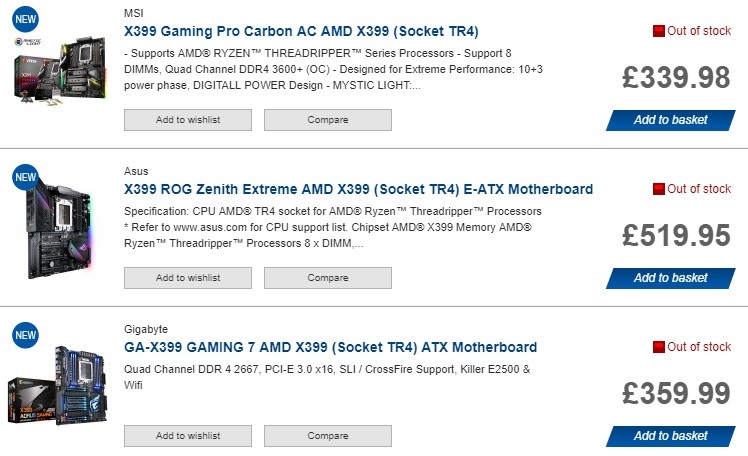 Some one duly pointed out to me on another forum that we haven't seen the X299 "Rampage"
i think at least AS expensive. Yup you watch that one's price will make your ring sting.